Part four of the Summer of Sketch series brings perhaps my most important pickups to the table. These are the Single Page Sensations and full collections of specific characters in my sketch card PC. I was able to make a half-dozen new additions to these collections, and here they be. Daredevil Seasons 1 & 2 Echo by Marla Agunos.. This is arguably my favorite card of this bunch, which is why I'm leading with it. It's all-around great, but there's something about the expression on her face that I'm particularly fond of. So many possible emotions being expressed in such a simple way. Brilliant! The scans of this great sketch by Don Mark Noceda do not begin to do it justice. I thought the first one was so washed out & a smidge blurry due to it being scanned with a couple of them there super thicc Marvel Premier sketch cards, but when I tried again this morning, well... It is slightly more in focus, but it's somehow even more washed out than the first one! 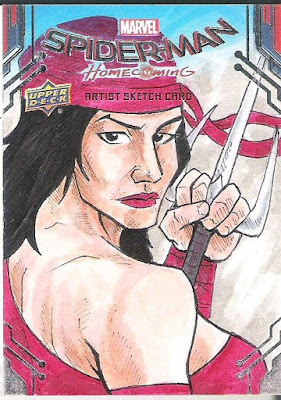 You can barely even see the splash of orange behind her head, but it is super vibrant & brings what is already a great card all the way together in real life. Spider-Man: Homecoming Elekra by Marlo Agunos.. 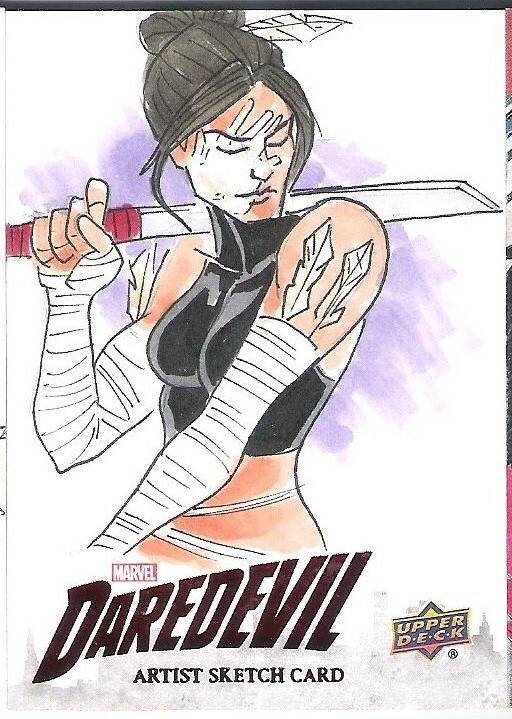 This Elektra is also by Marlo Agunos. This wasn't love at first sight like her Echo sketch above, but it has grown on me quite a bit since I got it in my hands. A most welcome addition to her page. Agent Carter She-Hulk by Gilbert Monsanto.. I had no idea about the Agent Carter set even existed until I picked up these two She-Hulks (I think this one is She-Hulk? 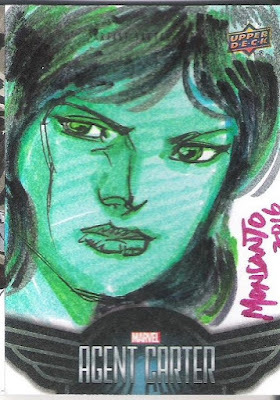 Not too many green chicks running around the Marvel U, but it could possibly just an odd shading choice for a regularly-hued character...) from the set. Honestly, I'm still not even sure what it's about. COMC just has autos and sketch cards, so perhaps it was just a higher end and/or super limited release. I dunno. Agent Carter She-Hulk by Monte Moore.. 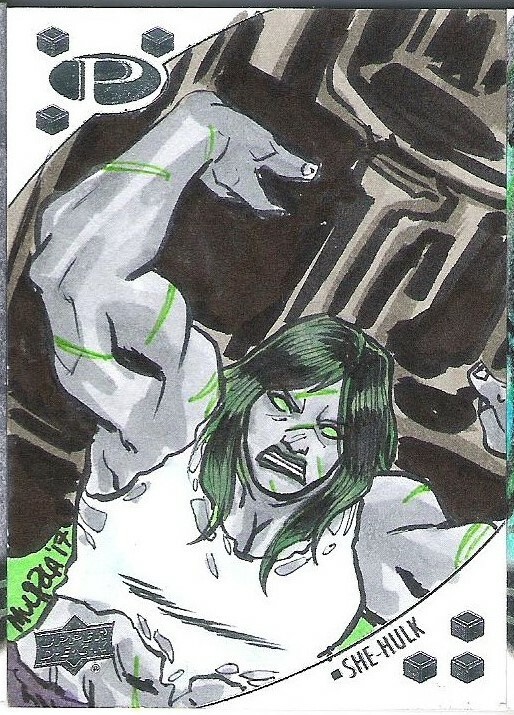 This sketch card is done in black & white, but that's definitely She-Hulk. I had already surpassed a full page before I got this trio, so I'm up to 13 or 14 now. 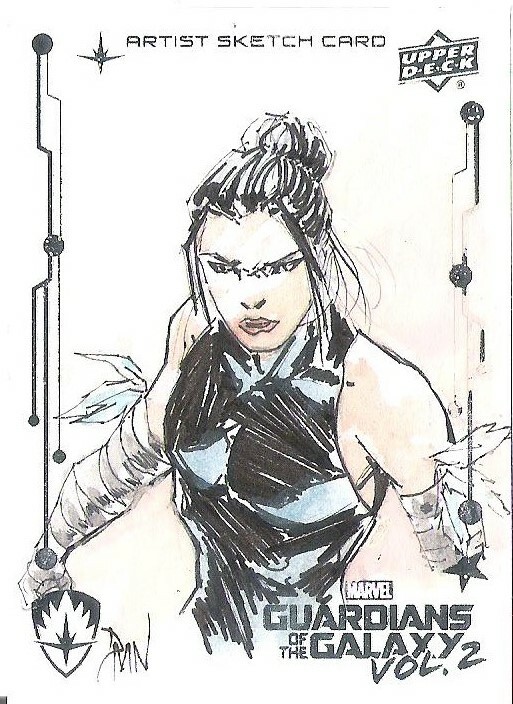 Aside from Raven, Rogue is the only other character collection I've broken the full page plateau on. With one possible exception, that being Raven's Titans teammate/popular ship pairing Starfire, who I have nine of, I have no intention or expectation of going over on any of the others. I'm not really even all that close with any other characters I have pages for anyway. 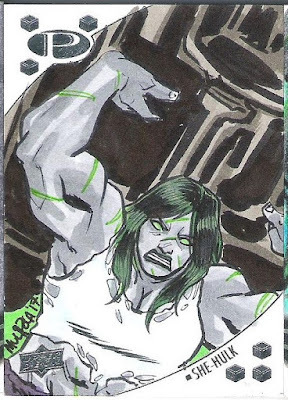 Premier Gray She-Hulk by Michel Mulipola.. Finally, I'm not sure what's up with comic book writers constantly feeling the need to make She-Hulk an overly serious character. I mean, they aren't usually bad portrayals, but it just sort of feels like it misses the point of the character in a pretty major way. I must admit I am deeply in love with the look of the gamma-scarred, hyper-muscular, PTSD-induced gray version though. I was surprised to find such a recent character design in a set, but I'm delighted to have it. That's all for now. Stay tuned for the Summer of Sketch finale soon. Thank you, as always, for stopping by! I can sit here all day and stare at these awesome sketches. I've got a few baseball autograph projects I'm working on, but one day I hope to get back on the sketch card kick.